Hail ping-ponged off my windshield like swollen molecules of an angry gas trying to get in at me. I crouched in the passenger seat where I had taken refuge, one boot on, the other still clutched in my dripping fingers. Outside the wind lashed the poncho I had hastily yanked over my backpack. "Maybe this isn't such a good idea," I muttered to myself. I had spent most of the morning jarring along gravel mountain roads beneath a mosaic of cold blue sky and blindingly white thunderheads bruised underneath with dull foggy drizzle, winding inexorably into the heart of California's King Range National Conservation Area. This stretch of the coast was once inhabited by the Sinkyone and Mattole Indians, the government brochure informed me. 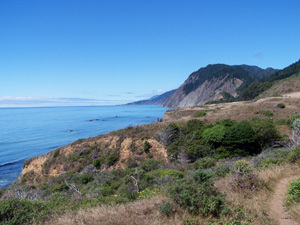 The so-called "Lost Coast" had been one of the most heavily populated Native American regions in North America for 8000 years before the white man arrived. Maybe so, but I hadn't seen a soul since I entered the area more than three hours ago. At the general store in Honeydew a large, friendly fellow in worn coveralls warned me that the weather forecast on his CB radio had turned ugly. Ordinarily a little rain wouldn't put me off. After all, I spent good money on Goretex rainwear, a urethane-coated tarp, waterproof stuff sacks, and a state-of-the-art, four-season tent, all of which were packed slickly beneath the whipping poncho outside. I had expected a few scattered showers for the rest of the day, but nothing like this. The Lost Coast is different. King Peak, at just over four thousand feet the highest point on the coast of the continental United States, manhandles the moist Pacific air, squeezes it against the sky, and wrings out an unholy amount of precipitation. Over 200 inches of rain fall annually in some places. And once it starts, it can go on for days. Long enough for condensation to wilt the loftiest down sleeping bag and clinical gloom to settle into a pilgrim's heart. As I contemplated my empty boot, wondering if I was really into this much pain, the hail gradually became a sputtering drizzle, then stopped. Slowly the sky brightened. A dazzling sun burst from behind the clouds, a rainbow flared, and the wet gravel steamed contentedly. I slipped on my boot, snugged down the laces, and stepped out into the hot May sun. Before me lay a dripping rain-forest of madrone, oak, and towering Douglas fir. A thick understory of blackberry, huckleberry, and salal was trying to choke the madrones, and a whole forest of brazen flesh-like limbs writhed in frozen agony. Moss clung to every available trunk, and sword ferns held what little ground remained. No cross-country work possible here, I concluded. Either stick to the trails or be eaten alive by the foliage. The Lightning Trail is the shortest route to the summit. I soon discovered that the trail hadn't earned its name for speed, but because it zig-zagged straight down out of the sky. New thorny shoots grew into the narrow path like clawed hands, snagging my pack, and droplets showered me as I broke free. Unseen in the canopy a jay rudely decried my intrusion. 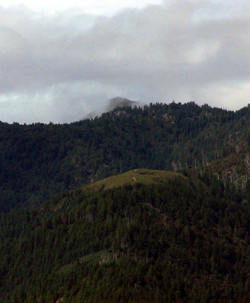 The sun had disappeared, and low clouds brooded overhead, obscuring the upper slopes of the mountain. The air grew heavy, and I realized I was in a race to get my tent pitched before the next downpour. My shirt, soaked with sweat, clung cold against my skin. An icy headwind greeted me as I crested a ridge at 3500 feet and swung south into a steep canyon curving toward the peak. With numb fingers I managed to erect my tent on a rocky flat wedged between a swift stream and sheer slope in a stand of Douglas fir. The canyon was a wind tunnel, funneling the cold northwest gusts down from the peak into my campsite. I gathered some damp wood and on my second try the fire caught. Why was it so cold? It shouldn't be this cold in May. My thermometer read 38 degrees and dropping. Hunched over the fire with my back to the wind, I ate freeze-dried shrimp creole and a fistfull of cashews. After dinner, I set out for the summit. The trail cut through the thick manzanita of the upper slopes and looped up to King Peak. The sky had cleared enough for a cheap-seats view. Just below the bottoms of the broken clouds the mountains rose on both sides of the Mattole valley like crumpled wads of fuzzy paper. 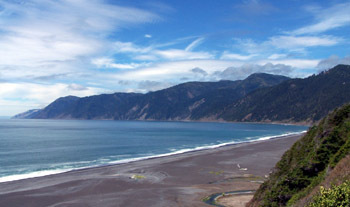 Four thousand feet below the Pacific pounded the Lost Coast. It looked a lot closer. The icy northwest wind quickly drove me back down to camp. But at least it wasn't raining. I slipped into my down bag confident things would be better in the morning. Sometime during the night I was awakened by the "tat . . . tat" of a loose line blowing against the tent membrane. No, not a line, water dripping, probably condensation off the trees. I went back to sleep and dreamed of grinning savages romping through a field of wildflowers. When I awoke with first light, the dripping had become constant. I crept out of the tent. It was snowing. Snowing! The snow metamorphosed into a steady drizzle. I resolved to outlast it. I resurrected my campfire and ate a dispirited breakfast. The drizzle became a driving rain. Smoke from my fire blew with increasing urgency in the wrong direction--east--as if sucked out to sea by the low-pressure inhalations of a looming beast. This was to be no passing sprinkle; the real bad-news weather was still hanging off-shore. I was cold, wet, irritable, and losing conviction. My spirit mildewed. After four hours of enduring the persistent wind-driven rain, the thought of my water-tight vehicle waiting an hour below at the trailhead, with its forced-air heat, reclining bucket seats, and Dolby stereo, became too much for me. I called it quits. I slogged down the steep trail carrying an extra ten pounds of water in my soaked gear. How, I wondered, did the Sinkyone Indians manage? They had no GoreTex, no nylon taffeta, no polyurethane coatings, no high-tec walking boots, no geodesic four-season shelters. They couldn't simply add water to a freeze-dried dinner. If they didn't catch it, find it, grow it, or dig it up, they didn't eat. Yet they and their ancestors survived here for 8000 years. How did they do it? The Sinkyone Indians had no other choice. It was this or nothing at all. No automobiles waited below at their trailhead. Rather, this environment chose them. The rain-soaked Lost Coast was one more of the countless harsh anvils upon which evolution forged the human being. Perhaps not as harsh as the Eskimo's arctic tundra or the stark slopes of the Sherpas' Everest, but harsh enough for me to throw in the towel for the weekend and run home to my color tv, electric blanket, and freezer full of Haagen-Dazs ice cream.